Capitol Fire Training is a corporation composed of experienced Fire and Rescue Instructors and Firefighters from all over the United States. Our Instructors hail from organizations ranging in size from the smallest to some of the largest and most successful depa rtments in our Nation. 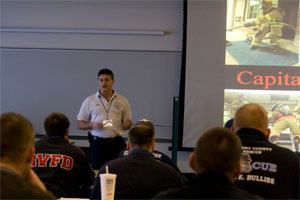 Capitol Fire Training Instructors share real-life training, techniques, and experiences that go beyond your everyday drills and manuals. We strive to make every lecture and hands-on training fun and interactive while simultaneously meeting the specific needs of your staffing, department, or organization.